Many popular router models have very simple depth setting, with no provision for zeroing a scale. 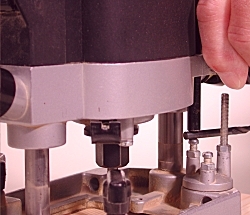 A quick and accurate method of setting depth of cut is to use the shanks of your twist drills as feeler gauges between the turret screw and the stop rod. The photos shows a 5mm cut being set with a twist drill. As a piece of good workshop practice, always set your final depth of cut on the lowest position of your turret, even if you’re only taking one pass. If you set it on one of the higher positions there’s a possibility, however remote, that before the job is finished you’ll twist the turret and cut too deep. For routers with basic stop bars, a dial gauge makes an excellent precision depth setting tool.